TAMINI is participating in the ALUMINIUM trade fair for the first time. Home > News > TAMINI is participating in the ALUMINIUM trade fair for the first time. The ALUMINIUM 2016 is the world's leading trade fair for the aluminium industry. Since its start in 1997 the fair has developed to the number one meeting place world-wide. The uniqueness of the show results from the fact that it represents the entire value chain offering solutions for the aluminium industry and all applications fields. It is the international meeting place for around 27,000 visitors who look for new solutions and technologies for aluminium processing and manufacturing. 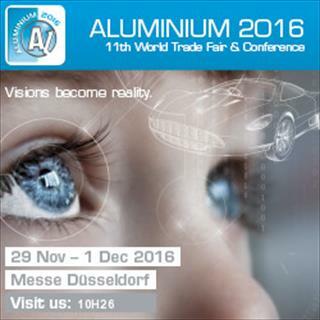 The ALUMINIUM will be held at Messe Düsseldorf, halls 9 - 14, from the 29th November to the 1st December 2016. Exciting and sustainable themes are represented in different pavilions for all industries from automotive, aerospace, building and engineering, electronic and electrical engineering to transport etc. The exhibition will be accompanied by the ALUMINIUM 2016 Conference, where current topics of the aluminum industry will be presented and discussed. In addition to the Conference, the high-quality presentation program of the special forums and Innovation Areas will ensure ALUMINIUM is a unique trade show experience. The integrated companies TAMINI and TES are participating for the first time in the show, together to celebrate their strategic combination (of a year ago) and the 100th anniversary of TAMINI. Sure that the event will be a great success, we would be really grateful to welcome you at our booth, N°H 26, hall 10. Please, do not hesitate to contact us for any further information about our participation in ALUMINIUM 2016.